In the small northern community of Fort Chipewyan in western Canada, as winter draws in, talk turns to the ice road and when it will be ready. 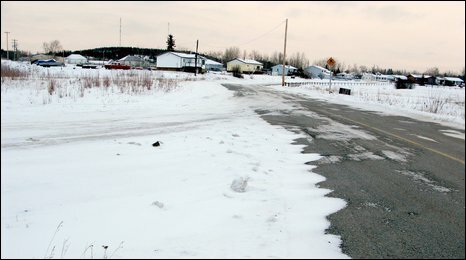 The isolated community of about 1,000 people is served year-round by a small airfield, but locals can only leave in their cars when the ice on the rivers south towards the nearest town, Fort McMurray, is thick enough to drive on. This winter, another subject is dominating conversations: how low can oil prices go? From a high of $147 (£98) a barrel earlier this year, they have dropped below $50. But unlike many people, locals are not hoping for oil prices to recover. Fort Chipewyan, a mostly First Nations (aboriginal) community, is downstream from Canada's oil sands mines on the Athabasca River in the province of Alberta. Current production is more than double what it was in 2000. Current rates are expected to triple by 2020, as more and more land is given over to mining and underground (in-situ) extraction of bituminous sand to feed the world's growing demand for oil. Many in Fort Chipewyan hope low oil prices will put the brakes on that development. They believe they are suffering from the aftershocks of an industry expanding at a rampant pace without the necessary environmental limits. It is a view backed up by independent environmental scientists and local doctors, but hotly contested by industry. George Whiteknife, known as Sloan, has lived in Fort Chipewyan all his life. He provides much of the food for his family and dogs by hunting, fishing and trapping. 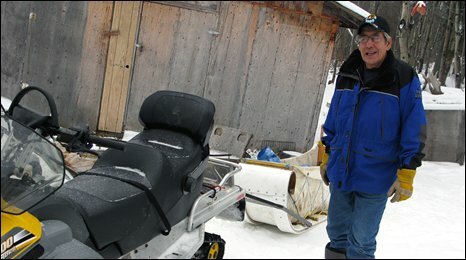 Sloan, a member of the Athabasca Chipewyan First Nation, says he first began noticing something was different about eight or 10 years ago, when for a period of a couple of weeks, the fish in Lake Athabasca seemed to disappear and his fishing net came out of the water covered in a black, oily substance. Since then, the changes have accelerated, he says. "Migrating birds used to fly through here - geese, snow geese, swans and all that. Now it seems like they're starting to leave this area," he says. Rabbits, mice and lynx are dwindling too, he says. The moose are getting skinnier. There have been reports of deformed fish with tumours, of muskrats found dead in their dens, of whitefish turning red. Some hunters and trappers were saying the meat tasted unusual. No one will now drink water from the lake, some refuse even after the water has been treated. 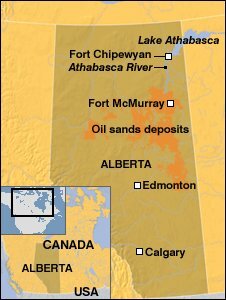 The oil sands industry, based around Fort McMurray, relies on the Athabasca River for water to help extract the oil from the sand. Waste water from the process is re-used many times, but it contains such high concentrations of naturally occurring elements like arsenic and mercury that it must be stored in vast, man-made lakes surrounded by earthen dykes, known as tailings ponds. Government and industry officials say no tailings water ever ends up back in the river, and point to data collected by their scientists to back this up. Martyn Griggs of the Canadian Association of Petroleum Producers (Capp) says the oil sands industry is the probably the most regulated industry in the country. However, in a report for the local Nunee Health Board last year, environmental scientist Kevin Timoney found higher levels of contaminants in the water downstream from the oil sands plants, suggesting that tailings could be leaking into the water system. Once in the water, the contaminants - which also include napthenic acids and polycyclic aromatic hydrocarbons (PAHs) - enter the food chain. Some of the most popular fish have so much mercury in them that they should not be eaten, Dr Timoney cautions. "When I gave the results of my report, I think many people were not so much shocked as they were reassured that their concerns were valid," Mr Timoney says. His conclusions are broadly backed up by David Schindler, a water ecologist and the Killam memorial professor of ecology at the University of Alberta in Edmonton. "I think it's very unlikely that mining on that scale is not increasing all of the amounts of pollutants coming... into the river," he says. The catalyst for the research was the number of deaths in the community from cancer, and in particular from a rare type of cancer, cholangiocarcinoma, or bile duct cancer. The incidence rate of bile duct cancer is usually about one in 100,000. Locals say they know of at least five or six cases in a population of about 1,000. 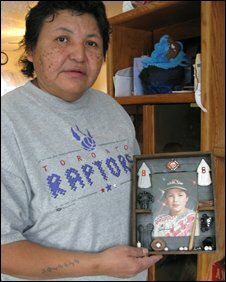 George Whiteknife's partner, Valerie, lost her brother-in-law to cancer. Her nephew Grant also died of cancer, just days after his 28th birthday. "Cancer is so common here, more than half the people who die seem to die of cancer," says John Rigney, who works for the Athabasca Chipewyan First Nation in Fort Chipewyan. Dr Michel Sauve, a consultant physician in Fort McMurray and the president of the Fort McMurray Medical Association, says he first noticed something was wrong about eight or nine years ago. "People from Fort Chipewyan were being hospitalised at three times the rate expected. They were sicker and there was no obvious explanation," he says. Dr Sauve knows of three proven cases of bile duct cancer. Two other cases were seen in Fort Chipewyan but the patients died and were buried before anyone could get tissue evidence. "To see multiple cases of bile duct cancer in a small population would seem very disproportionate," he says. "When it hits, it's a devastating disease, usually picked up too late for treatment." The government says the number of confirmed cases is lower. 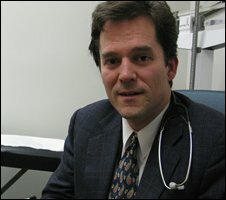 A report by the Alberta Cancer Board in 2006 found that the numbers were elevated but not high enough to cause concern. 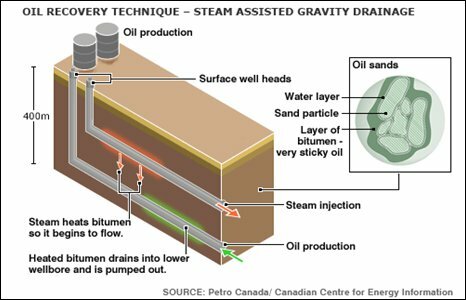 "It was conclusive that there was no connection between oil sands development and cancer rates," says Alberta's Deputy Premier Ron Stevens. Locals say that study was haphazard and failed to take into account two years of data. A second review by the Alberta Cancer Board is currently undergoing peer review before being published, but its conclusions have already been rejected by the community. Mr Stevens describes the reaction as "inexplicable". "It seems to me that perhaps there's some politics going on," he says. But George Poitras, former chief of Fort Chipewyan's Mikisew Cree First Nation and currently its environmental advocate, says the community was not consulted as research was being carried out. Dr Sauve says the study is just a review of known cases, and has called for a thorough investigation into how many cases there have been in the community, compared with a similar community elsewhere. "All we know is that there is cause for concern... and we have concerns that there's an environmental factor causing this," he says. "The people downstream can be protected if they know what the dangers are, but what's wrong is to keep them in the dark." The process has left trust in the government at an all-time low, says Mr Poitras. The community has decided to find its own answers to the water quality question, commissioning its own research and speaking out to the media. In the meantime, the growing development of the oil sands is threatening the very existence of his people, Mr Poitras says. "When people are dying at the rate they are dying in our community, I don't think that's over-dramatic," he says. "There's a big concern about the very existence of our community, of our people, being wiped out by industrial development." Alan Adams, the chief of the Athabasca Chipewyan First Nation, says most people do not want the oil sands industry stopped, but want the pace of expansion to slow down. He believes low oil prices are a temporary fix, and that once the economy bounces back, "they're going to be back in there harder than before". On Thursday, Sarah Shenker reports from Fort McMurray on how residents are coping with the effects of the growing oil sands industry.